The best way to donate via bank transfer is to complete the donation on this website and choose ‘Direct bank transfer’ on the Checkout page – we’ll send you an email with an order number to use as a reference and our bank details. The online order gives us all the details we need to process your donations efficiently (type of donations and projects you wish to support). Specify the type of donation in the Payment Reference when you’re completing the transfer request, ie. Lillah, Sadaqah, Zakaat or Fitrah (Sadaqah-ul-Fitr). If it’s not just a simple donation, e.g. to the most needy, then please Email Us the details of your donation. If you are a UK tax payer, please also complete the Gift Aid Form. 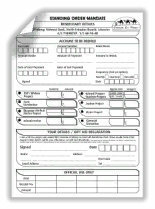 Download, print and complete the form using the link above, then hand it in at your local branch. Make sure to Email Us the details of your donation, like ‘Zakaat for Orphans’ or ‘Sadaqah for Water Projects’. If you’re a UK tax payer then please also complete the Gift Aid Form.